Good afternoon friends! It's been a while but I am here today with a quick post! I've been busy with a million different things but also taking full advantage of the most beautiful fall weather! More about that later! 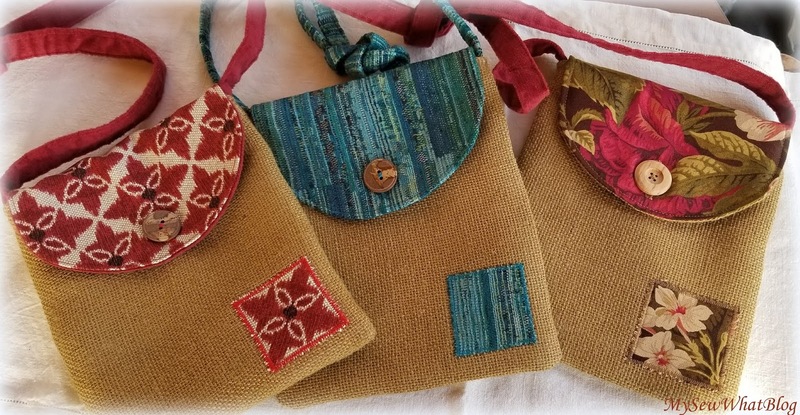 But first, I finished some more burlap bags and have not gotten around to posting them, so here they are! Yesterday my husband, my dog and I went for a walk at a state park nearby. It is one of our favorite places to walk the dog because it is beautiful all four seasons and my dog really loves it there. We rarely run into others on this road and it is a nice walk from the dam at one end to the beach area at the other end. It was about 4:30 in the afternoon and the sun was warm and bright, the sky was a gorgeous blue and there was the most amazing breeze. The trees weren't too shabby either! We have had so many beautiful days to enjoy the changing leaves. Just a couple weeks earlier, we were in the Berkshires celebrating our 35th anniversary. The foliage was not quite this bright but still so pretty! I enjoy every stage from the first signs of golden greens to the brightest reds! My dog will tell you that she enjoys the smell....on every leaf....on every bush...on every weed....and every tree....groan! It was a looooong walk with lots of stops (to sniff) and starts......with so much to look at, we didn't mind. Every time I walk on this dirt road, I am reminded of Robert Frost's poems....so picturesque....doesn't matter what season. We thoroughly enjoyed this late afternoon walk and we are so grateful for this continued glorious weather! Last but not least, my husband is at the top of the hill in our back yard blowing the leaves. In our city, once the leaves are raked to the road, they are picked up for us! Now that's service! Happy fall everyone. Have you all been doing some fall baking? I've baked pumpkin bread, zucchini bread and apple cake!